Color: Find the layer group “Change color here within the group “Background”, and make your choice! Logo: Double click on the smart object layer “Replace logo here”, Place your logo on the new opened window and save. 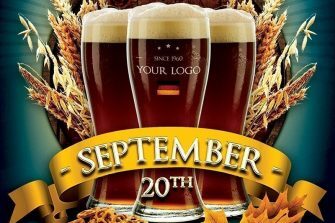 Check out this Beer Party Oktoberfest Flyer Template and Create amazing Oktoberfest flyers for your bar. Download high quality psd for your Event Now!